The Visual Dome is a 9′ diameter, manually operated dome made of GRP by Pulsar, sat on a 8″ thick x 5M square concrete base. Inside is a 14″ Meade SCT on an 8″ dia. steel pier, bolted to the concrete base. 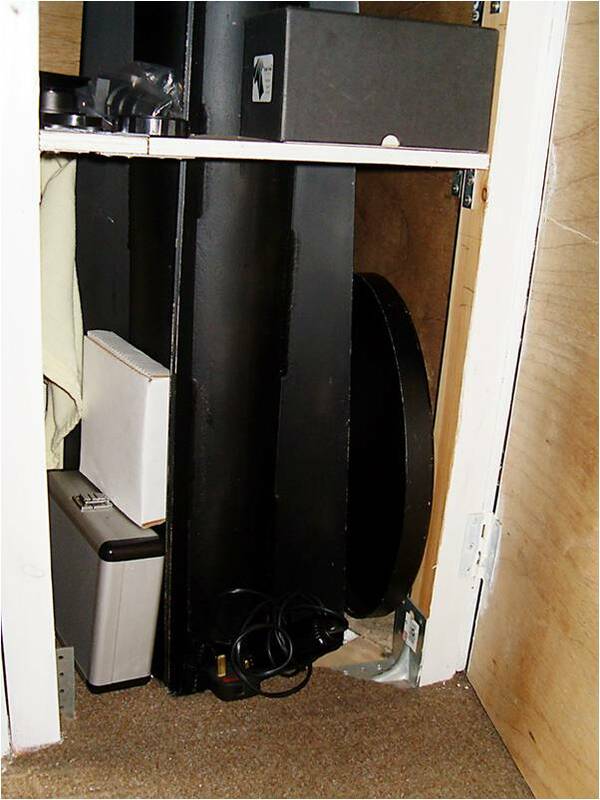 A wooden cupboard surrounds the pier without touching it, to house a variety of eyepieces and such equipment for visual observing. 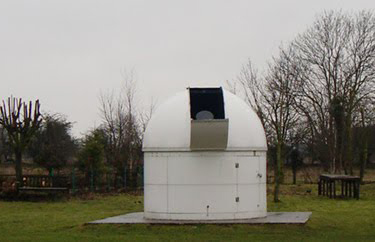 Riding on the Meade is a Skywatcher 80ED refractor. 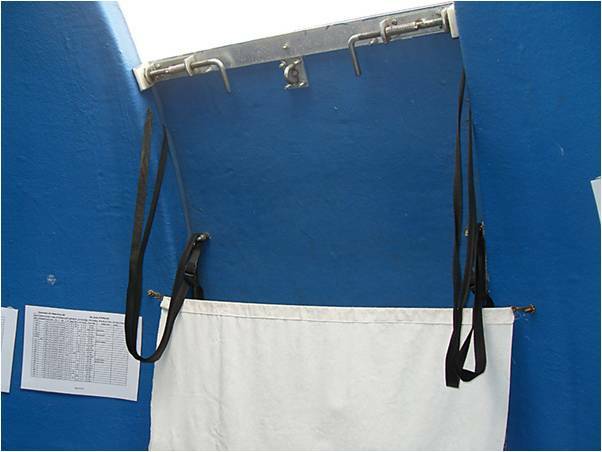 Attached to the west wall of the cupboard is a folding table used to carry a laptop for the control of cameras on either telescope. Open the door, and replace the lock in the hasp rather than take it inside, to ensure it will be ready for when you’ve closed down and come out. Turning to your right, near the floor, you’ll find the electrical panel. Turn on the two top plugs, for the lights, and the two bottom RIGHT pair, Telescope and Auxiliary. Don’t touch either the red master switch or the two bottom LEFT plugs. They power the new dome and the power socket panel on the table in this dome and are always left on. 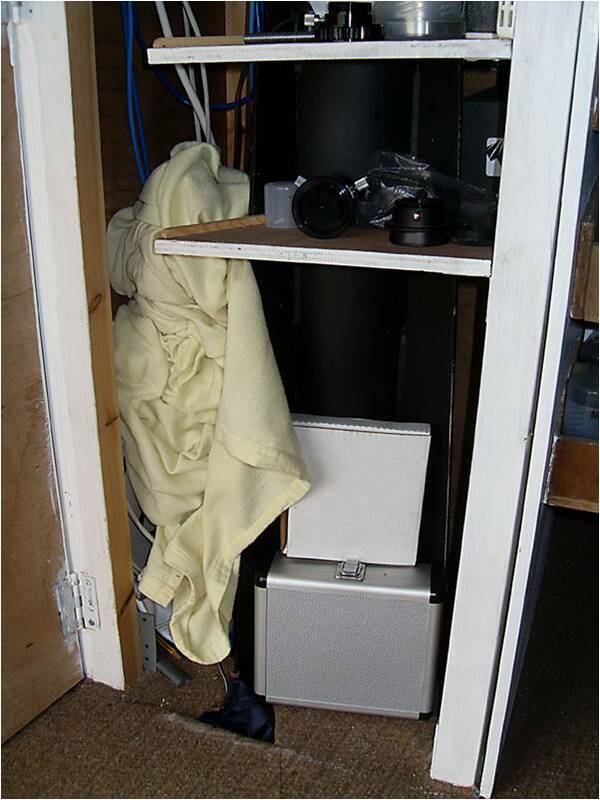 Take off the telescope’s dust sheet and store it in the cupboard facing the door. You’re now inside, so go to the back of the dome where the boathook is hanging from the shutter top. The next part is easier for a tall person; shorter folk may have to stand on a stool. On either side of the shutter you’ll see the securing bolts. 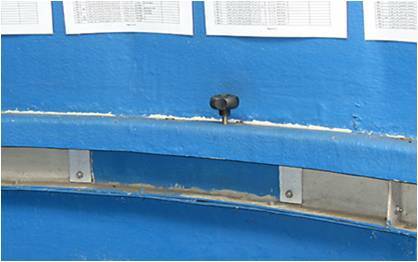 These secure the top to the bottom halves of the shutter and both of them to the rest of the dome, so when putting these back, you must be sure they are fully home and fully engaged. Note the relationship between the top and bottom hook attachments, if the top one is further away, the bolts will not engage it and secure it to the dome sides. 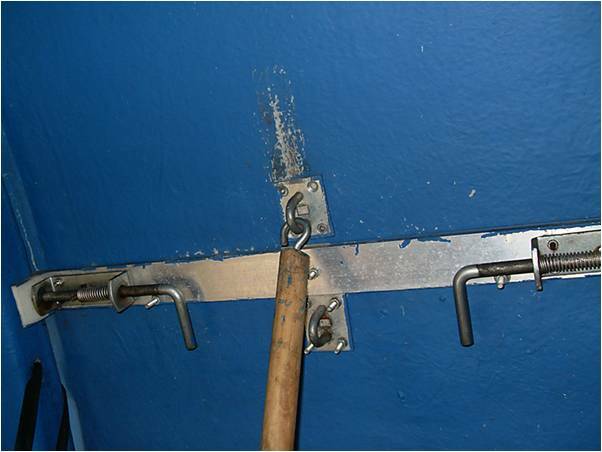 Securing bolts in fully open position, the right-hand one is easier if positioned upwards. Slide the bolts to the open position by pulling them inwards, past the screw under the bolt that holds them open, and turn them upwards, rather than downwards as shown here to lock them open. 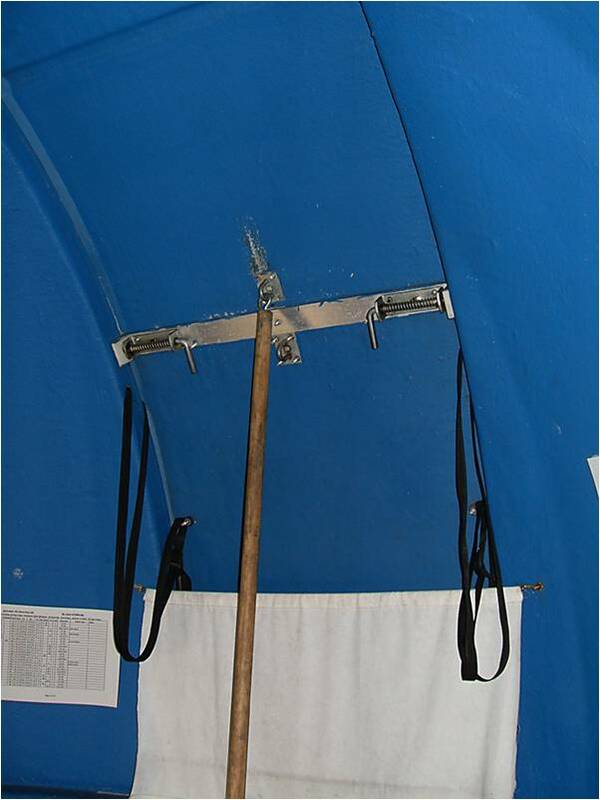 Then using the boathook, slide the top shutter and over the top to open it. This is not easy and needs care and a tight grip on the boathook, or it will run away with you suddenly as its weight passes over the top. So do it slowly and carefully, till you get experienced in doing it. Not easy to put into words so you’ll have to watch others doing it and practice. But, don’t let go of the boathook! When fully open, disengage the boathook and store it to the right of the door. To open the bottom half of the shutter, grasp the loops of black tape hanging from the top of the shutter bottom half, tightly, and smartly push it outwards and quickly catch it’s weight before it goes too far, with the tightly held tapes. Lower it to it’s fully our position. The dome top runs on rollers round the top of the walls and is held from spinning in the wind, by three vertical hand screws. I usually only use one, the one on the south of the dome. Unscrew it and place it on the shelf under it’s position, not just anywhere, because you’ll have to replace it later and will need to find a very small hole in the dome top and position it over an equally small threaded hole on the wall top which you won’t be able to see easily in the dark, so it helps to do this bit with care. The positions are marked with white paint. Anti-rotation bolt. Store it exactly under its position. All the dome part of the job now done, so on to the telescope. When you switched on the electrics, you started up the telescope which did all its initialisation work while you were fiddling about with the dome, so it’ll be ready for you now. Remove the telescope cover, not heavy but high up, and store it in the cupboard at the bottom right of the pier, there’s a place there that fits it well and it will be out of the way of your big feet and the dust raised by your tramping round if you lean it up against the wall. Then fit the foam dew shield to help reduce moisture condensing on the corrector plate. It is normally stored on a “string” at the back of the dome top. Put it back there when closing down. 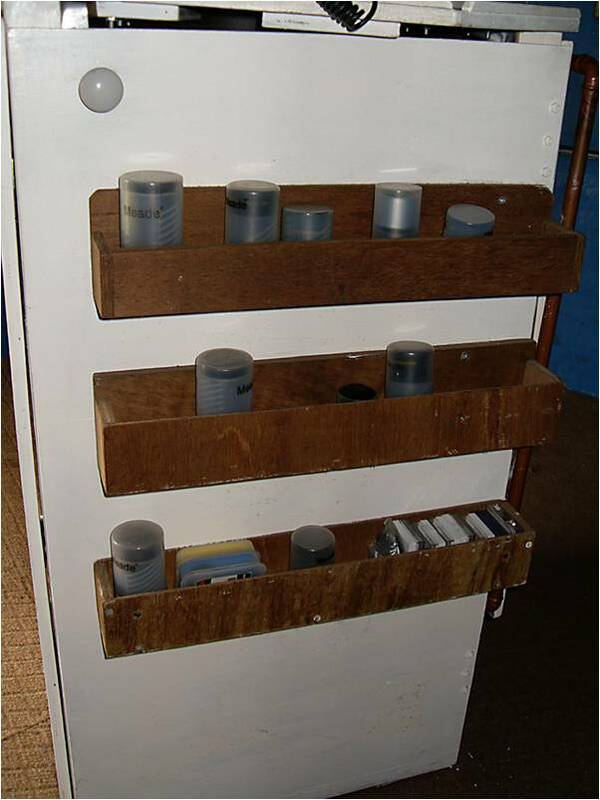 This shows the business end of the telescope with an eyepiece in place, taken from the shelves on the outside of the northern cupboard door. 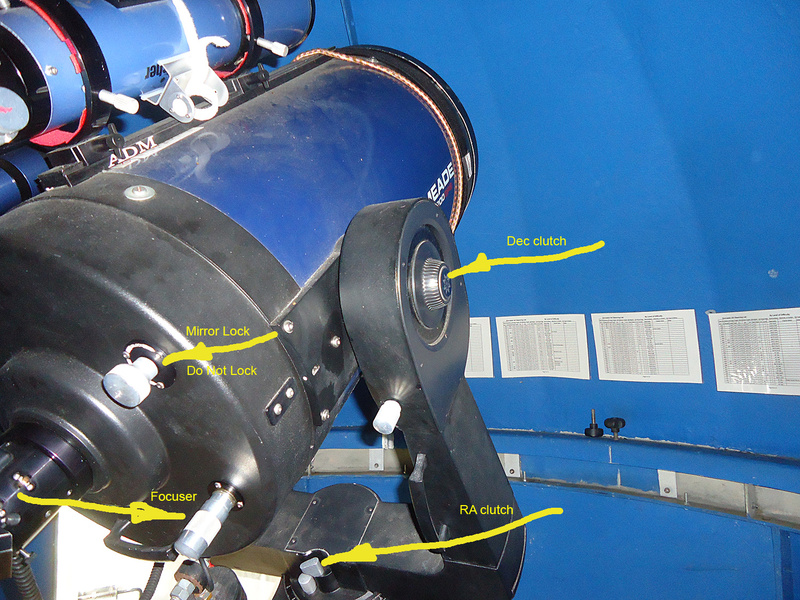 It also shows the other telescope, the Skywatcher 80ED riding on the 14” Meade. The same eyepieces can be used for the 80ED too, but it needs the star diagonal, refered to by us as the bendy bit, to get the eyepieces into focus. The 80ED has an accurate Moonlight focuser with a range of about 4 inches. The Meade focuses with a knob to the bottom right, and the range here is about 53 turns of the knob. To focus the Meade use the long narrow knob on the back plate. The flatter one above it is a lock for the primary, and is better left open. Do Not Lock it! 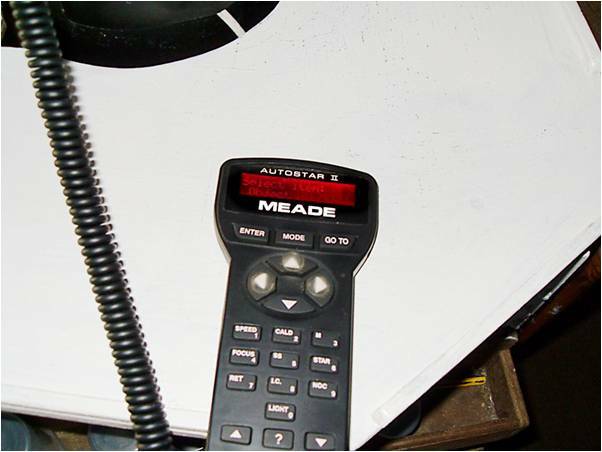 Notes on getting the best from the 14″ Meade. She likes users to be masterful, so don’t squeeze the buttons in a ladylike fashion, press them sharply, but you must also give her time to do what you ask, so don’t press buttons one after another too quickly or she’ll take umbrage and fold her arms on you. At all times wait till the screen display tells you what she’s doing and only take the next step when she puts a response or question on the screen. She can be slow, so don’t take her slowness to mean that she didn’t receive your instruction and then do it again! This is likely to cause problems. So ensure you input your key presses with care and sharply. If you get lost in the handset, press the Mode button a few times till the display returns to Object, then start again. However, if she doesn’t do as requested, and points wrongly or to the ground, you must close her down by Parking her (see below in Closing down instructions), then re-positioning her tube manually, by releasing clutches to point her to the Park position, which is DEC to 90 Degrees and RA to point the tube due south. Then re-start after a 10sec wait. The clutches — the DEC clutch is the large knob at the top of the right hand arm, the pivot point, and the DEC indicator is opposite it at the top of the left arm. The RA clutch is the small tab on the bottom plate. In both cases, make sure you are holding the telescope tightly, as slackening either clutch will allow gravity to move it suddenly, and it is heavy. Take a look at the handset and you should see on the display, Select Item on the top line and Object on the bottom line. Choose a bright star that you can see and whose identity you know. Press the 6 button (star) and the display will change to Named to which you respond by pressing the Enter button. This is used to confirm an instruction, to say yes to her question. The display should now change to the first star of a very long list. Now use the scroll buttons at the bottom of the handset to scroll through the list, till you get to the one you’ve chosen. With that on the display, press Enter. When the star’s data appears on the screen, press the GOTO button. She will then tell you that she’s taking a GPS fix. But the GPS doesn’t work so you must press Mode, and enter the data yourself. She will ask daylight saving time Y/N. The Enter key is Yes. Then enter the Time in either AM, PM or 24 hour format, use the scroll buttons to make sure you have it right and press Enter. Then the Date, using the number keys, and the direction keys to move across the screen, then Enter. Then agree to AUSTERFIELD as the location by pressing Enter when asked. This last may take 10 seconds or so, so be patient. You’ll know when she’s done as she will slew to the chosen star, and you’ll know when she’s got there, because the display will tell you that she’s stopped slewing. You need now to synchronise the telescope to the sky and you do this by centralising the chosen star in the eyepiece. Easier to start by centralising it in the finder, but as she had just slewed to it she will be on Max speed. So to adjust to an easier to control speed, press the 1 button, then press the 3 button, to change the speed to 8x Sidereal rate. Slewing speeds, there are 9, and are changed by pressing 1 then another number key, 1 then 1 gives you Guide speed, 1 then 0 gives you Max speed. Using the Direction buttons centralise the chosen star in the middle of the finder, then the eyepiece. Now hold down the Enter button for 3 secs, release it and press it sharply again. The screen will show what is happening. This will synchronise the telescope with the sky. 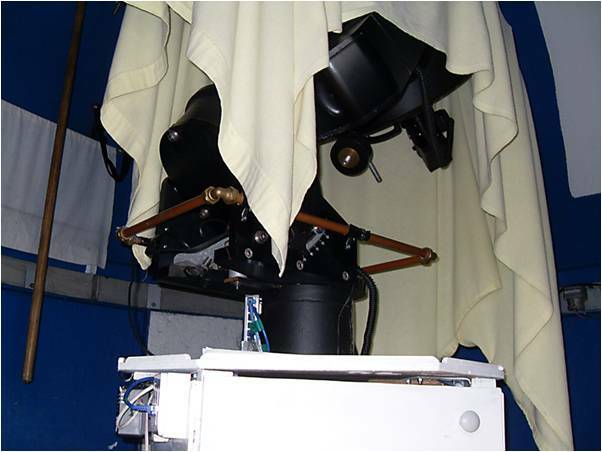 It is as well to check the alignment between the main telescope and the finder. If they aren’t aligned, centralise the star in the main telescope and adjust the finder to suit. This may sound false, but when you start you do so with the finder and if that is not aligned, you’ll have great difficulty in finding the star you seek. For back up the manual for the telescope is in the cupboard below. You are now ready to start your observations. When closing down you must first Park the telescope, and to do this press the Mode button a few times, till the screen displays what you saw on starting up, Select Item on the top line and Object on the bottom line. Press either of the scroll buttons till the display shows Utilities. Press the Enter button to confirm. Then press the scroll button again till Park shows on the bottom line. Press Enter and get on with the rest of the work of closing down as the telescope should not be touched again. 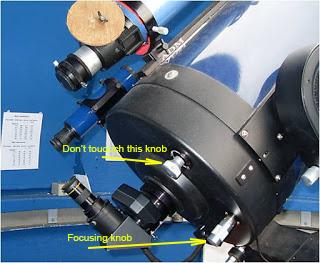 Do not switch the telescope off, that is done when switching off at the main wall sockets. You must retrace all the steps listed above in reverse order of course. Putting away all eyepieces, filters, covers etc. in their proper places. 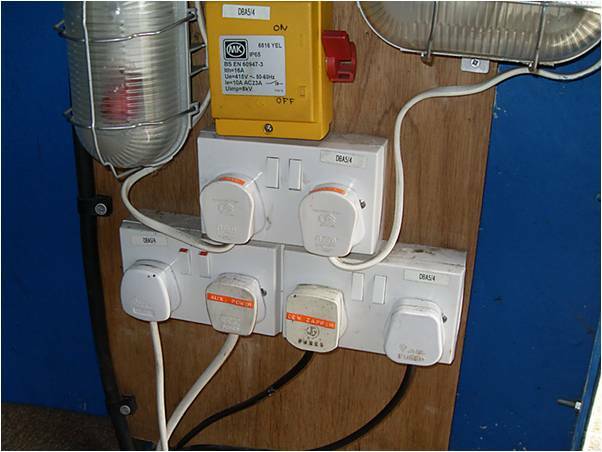 Perhaps a bit pedantic but in the dark on your next visit you’ll rely on them all being in their places. 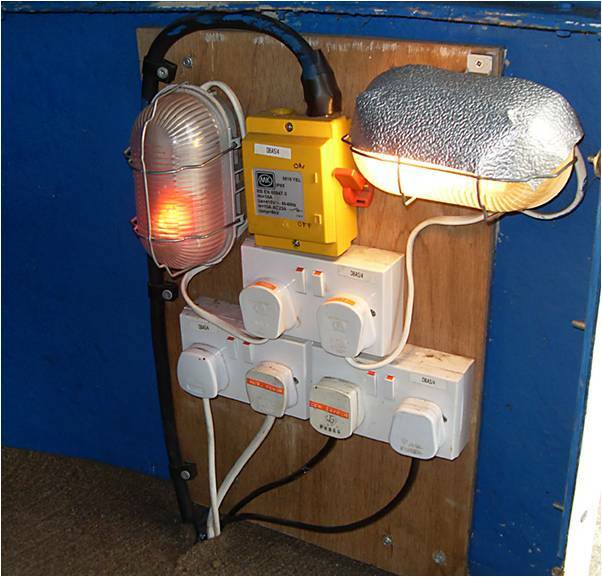 Leave the boathook on the shutter, and lock the shutter bolts and turn off the 4 plugs you turned on and locking the door.